The Vancouver Condo Buzz » First Release March 2nd! ROYCE White Rock Condos from low $300’s by Forge Properties. Unobstructed Panoramic Views from these Oceanside White Rock Homes at Royce Living! « LAUNCH! Concord Gardens Richmond Master Planned Condo Community with 68,000sf Park by Concord Pacific > 1 to 3 Bedroom Richmond Concord Gardens Condos from $236,800! 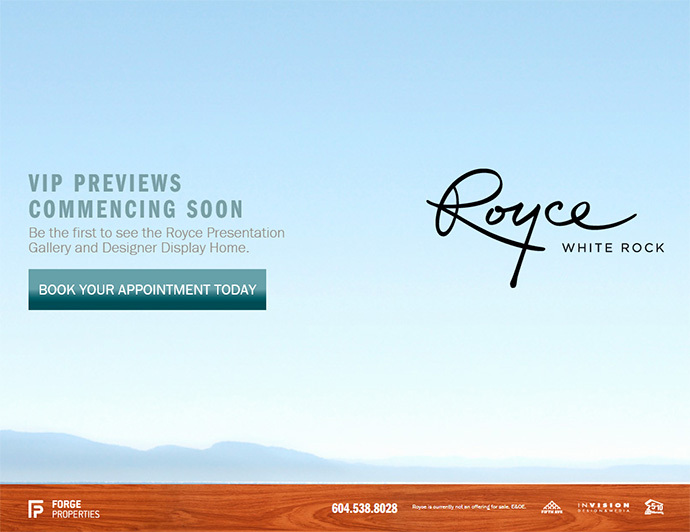 A boutique collection of view inspired residences is coming soon to the spectacular White Rock Royce condos for sale! Situated at Thrift and Everall White Rock, the Royce Condos feature only 80 view inspired condominium residences offering a wide range of both 1 and 2 bedroom homes, many of which have dens. This is a very exclusive opportunity for home buyers to purchase a brand new home on a south facing slope in the White Rock real estate market. The pre-construction White Rock Royce condos for sale will also feature very dynamic, eye-catching and unique architecture. The ultra modern interiors will feature high-end finishes and appliances and premium flooring. The floor plans at Royce White Rock condos for sale will be open concept and very functional. The White Rock Royce Condos will be located just minutes (within walking distance) to the beautiful beaches, waterfront promenade, shopping options and galleries in the downtown area. For more information about Royce White Rock condos, please visit www.royceliving.com today. The new Royce White Rock condominiums start from an affordable $339,000! VIP Previews for Royce Living in White Rock real estate market begin in early February at the Royce Condo Presentation Gallery that is located on Thrift & Everall White Rock BC. FIRST RELEASE is March 2nd at 12 noon sharp! As the marketing tagline reads: Make this your everyday – an exclusive enclave of luxury White Rock Royce condo residences in one of the province’s most coveted ocean side communities. With unobstructed panoramic views, superb amenities and exceptional detailing at every corner, Royce White Rock condos for sale offer a rare sense of serenity high above the Pacific Ocean. A place where location and luxury reside. Royce White Rock condos start from just $329,900! The developer is FORGE Properties. Located along the Oceanside community of White Rock Royce condos presents an exclusive enclave of luxurious homes located in the heart of the city. The offering includes spacious 1 bedroom and den condominium residences all the way to 3 bedroom homes up to 1,500 square feet (approximate) and all of the homes have designed to optimize the panoramic views from the comforts of your own home. The new Royce White Rock condos for sale are brought to you by Forge Properties along with an award winning finishing team that includes Ankenman Associates Architects and Kleen Design interiors. The truly West Coast contemporary exteriors and interiors are unsurpassed by other new developments in the White Rock waterfront real estate market. The tiered wood and glass architecture outside is very striking, modern yet elegant. Ankenman Associates architects have done a fabulous job incorporating unique elements and curves to the building façade, giving a great curb appeal from many angles. As well, the interiors of the Royce White Rock condos for sale will have superior finishes that include marble, butler style pantry for storage and outdoor balconies and expansive decks for all homes. MAKE THIS YOUR EVERYDAY. Introducing Royce in White Rock real estate market – an exclusive enclave of luxurious White Rock condo homes in one of the province’s most coveted oceanside communities. With UNOBSTRUCTED PANORAMIC VIEWS, superb amenities and exceptional details at every corner, the presales White Rock Royce condos for sale offer a rare sense of serenity high above the Pacific Ocean. The Royce White Rock condos is a place where location and luxury reside together. The new White Rock waterfront condos start from just $339,900 which is very affordable for this location and the size of the homes. The new White Rock Royce floor plans range in size between 717 to 1,501 square feet (all approximate and subject to change at any time!). In addition, the construction is already underway with an expected completion/move-in date in mid to late 2014 (about 1.5 years away). According to a recent article published in Westcoast Homes & Design, “Offering a rare sense of serenity high above the Pacific Ocean Royce White Rock Condos is a place where location and luxury reside.” You can now preregister your interest. The official grand opening of the presale White Rock Royce condos for sale is scheduled for March 2nd at 12 noon (Saturday). Marketing by Fifth Avenue Sales and Marketing. The VIP Previews for Royce White Rock waterfront condos have started at the Royce Presentation Centre located at Thrift and Everall.